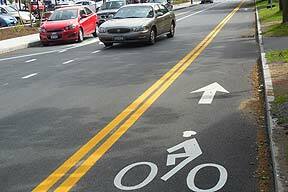 The City is completing its Bike Master Plan which aims to develop and implement a network of bike infrastructure throughout the City of Richmond. Grayland Ave was identified as a corridor that could benefit from improved bike infrastructure, specifically in the form of what is called a contra-flow bike lane. Because Grayland parallels the Downtown Expressway and has minimal intersections and stops and low traffic it facilitates efficient and safe bike access along that corridor. However since it is one-way and very wide, and parallel streets aren’t as conducive to bike travel, people often ride against traffic as well. Additionally, with the reconfiguration of the off-ramp at Grayland/Idlewood, access in and out of Oregon Hill will be improved and this corridor will likely see more bike traffic between the Randolph and Oregon Hill communities. So the concept is to add a contraflow bike lane on Grayland, which is essentially a bike lane that would head westbound, while in the eastbound direction the shared travel lane would remain (cars and bikes both use the travel lane). Much of Grayland has low parking demand and considerable parking restrictions, so the impacts from this would be minimal. Jake has expressed a strong desire to broach this concept with the community and seeking to be present at civic association meetings. If you have specific questions or concerns, please contact Jake directly at jakob.helmboldt [at] richmondgov.com. This entry was posted in Uncategorized and tagged contraflow bike lane, projects. Bookmark the permalink.